WHAT DO EFFECTIVE INTERNATIONAL SCHOOLS LOOK LIKE? The Effective International Schools book series addresses significant current and future educational and global issues in a format that is easy to access, easy to read, and immediately impactful in schools. The series upholds our core values of collaboration, professional growth, innovation, and excellence. ECIS has a wonderfully varied and diverse membership of schools that face common challenges and share similar values. As such, we see our role as aggregating and synthesising the ideas, experiences, and wisdom of member schools, so that all may benefit. ECIS has offered this series for many years, and we now follow a self-publication schedule. 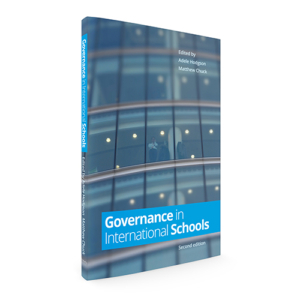 Please click on the image below to order our current edition of Governance in International Schools (2nd edition). If you wish to consult our catalogue of past publications that are still available for purchase, please visit the John Catt bookshop.